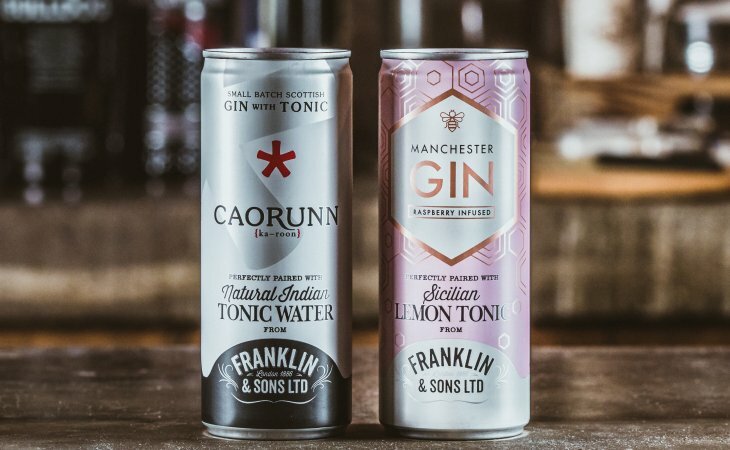 Franklin & Sons, the premium soft drink, tonic and mixer brand, has unveiled its latest partnerships tapping into the growing ready to serve and gin and tonic boom, creating two new variants with Manchester Raspberry Infused Gin and Caorunn Scottish Gin. Award-winning Franklin & Sons Natural Indian Tonic Water has been paired with small batch Caorunn Gin, crafted in Scotland. Ready to serve at 6% ABV, the 250ml can is a modern premium “London Dry” Gin, crisp and aromatic with floral, fruity notes. An alternative twist on the classic, Manchester Raspberry Infused Gin is perfectly paired with Franklin & Sons Sicilian Lemon Tonic Water. The sweet flavour of raspberries balances beautifully with the citrus burst of Sicilian lemons to make this an unmistakable combination. The 250ml stylish pink and rose gold can has a 5.5% ABV. Seb Heeley, co-founder and master distiller, Manchester Gin said: “We have been working with Franklin & Sons for a number of years, so when the opportunity came up to collaboratively work together so people could enjoy a delicious Manchester Raspberry Infused Gin & Tonic on the move, we jumped at the chance. Both new G&T cans add to Franklin & Sons growing portfolio of spirit and mixer partnerships, with the brand launching a premium crafted gin & tonic can earlier this year with Portobello Road Gin. The new cans are set to raise the bar in the RTS spirit and mixer category, currently worth £113m in the off-trade with cans leading the ready to drink format and driving category growth. Franklin & Sons was originally launched in 1886. Having led the industry with its dynamic range of drinks since that time, the company is driving forward sales of premium mixers, tonics, and soft drinks. Consequently, the brand continues to grow nationwide, while maintaining its family-oriented roots. All of the Franklin & Sons drinks use only natural flavours and extracts with no artificial sweeteners or preservatives.